Penelitian - Estimating the number of animals participating in a choral display may contribute reliable information on animal population estimates, particularly when environmental or behavioral factors restrict the possibility of visual surveys. Difficulties in providing a reliable estimate of the number of singers in a chorus are many. 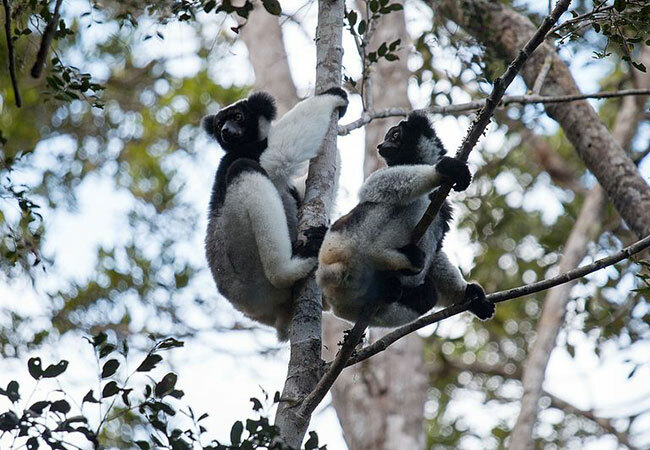 Valeria Torti of the Department of Life Sciences and Systems Biology, University of Torino, contributed data on the vocal chorusing of the indri lemurs (Indri indri), which emit howling cries, known as songs, uttered by two to five individuals. "We examined whether we could estimate the number of emitters in a chorus by screening the fundamental frequency in the spectrograms and the total duration of the songs, and the reliability of those methods when compared to the real chorus size," said Torti et al. The spectrographic investigation appears to provide reliable information on the number of animals participating in the chorusing only when this number is limited to two or three singers. The researchers also found that the Acoustic Complexity Index positively correlated with the real chorus size, showing that an automated analysis of the chorus may provide information about the number of singers. "We can state that song duration shows a correlation with the number of emitters but also shows a remarkable variation that remains unexplained. The accuracy of the estimates can reflect the high variability in chorus size, which could be affected by group composition, season and context," said Torti. "In future research, a greater focus on analyzing frequency change occurring during these collective vocal displays should improve our ability to detect individuals and allow a finer tuning of the acoustic methods that may serve for monitoring chorusing mammals," Torti said.